If you already own supplies, do not purchase more until you have decided that what you have will not work for these lessons. It's possible that what you have will work just fine. Your paper should not overly buckle when wet and should allow a fair amount of "scrubbing" to remove paint without falling apart. Your paints should flow across the paper with a nice spread when adding color to water-damp areas and allow time for blending before drying. 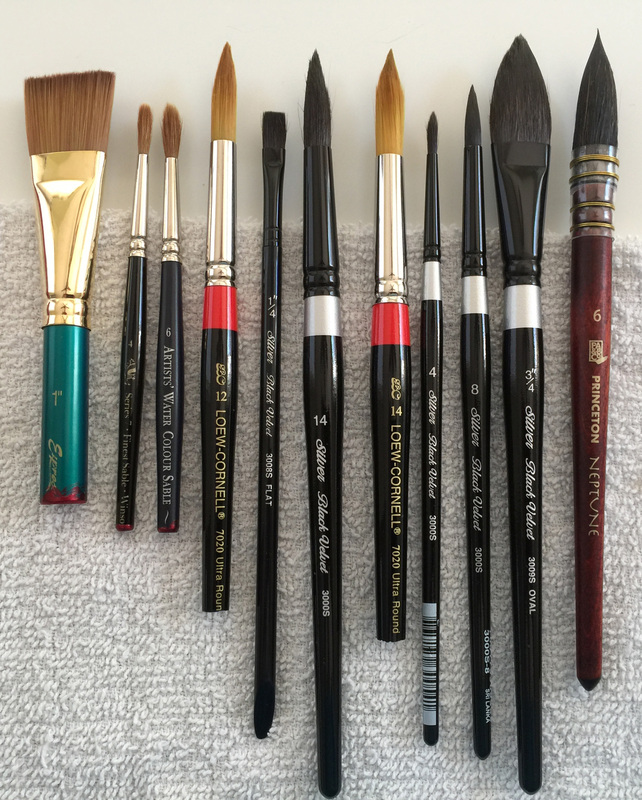 Your brush collection should have soft tips that easily hold water and paint. You should have one that comes to a nice point when wet (with long hairs and a fat belly to hold the paint and water as opposed to a tiny size 0 or 00 brush with very few, very short hairs), and one that can be used to apply a lot of water/background quickly (mop or flat), and one that has a more rounded tip when wet. Your palette should be something that works for you. Amazon links are provided strictly for your convenience so you can see exactly what items I recommend. If you have an equivalent item, save your money. You can always come back to this lesson later. If you already own equivalent supplies, don't buy these unless you personally decide you want or need them. These are the things that will give absolute beginners the most versatile starter set. Make sure you get watercolor brushes so the bristles are soft and will hold a lot of water. If your budget wont allow the below, you can use the Loew-Cornell #12 above for your washes. Silver Brush 3009S-034 Black Velvet Short Handle Blend Squirrel and Risslon Brush, Oval Wash, 3/4-Inch OR Princeton Artist Brush Neptune, Brushes for Watercolor Series 4750, Quill Synthetic Squirrel, Size 6 There's more variety of brush stroke on the Silver Black Velvet oval wash (does really pretty petal shapes, and an easy narrow/wide by twisting). The Neptune holds about two to three times as much water/paint and is excellent for quickly covering really large areas. If you intend on doing large paintings, the Neptune is worthwhile. Arches 300g (150lb) Cold Press Watercolor (or Hot Press, if you prefer), block, pads, or sheets, whatever you prefer. There's advantages and disadvantages to all of them. Arches Watercolor Block, Cold Press, 9" x 12"
Watercolor Pad, Hot Press 9"X12"
Watercolor Block, Hot Press 10"X14"
https://www.youtube.com/watch?v=D_AnLl0PMlo - a great review of papers. Board to attach paper to (need to be able to lift and tilt, and should be big enough for your entire paper) - I like using a gesso board, but I have also used foam core and wood. You want something that wont bend and is non-porous. Don't get the things in this section unless you really want them and are painting enough to justify them. You can get along fine without them. Color wheel (There are many of these available as graphics free online. Specifically look for one that is the Munsell color wheel (5 primary colors), as opposed to Newton's red-yellow-blue. The things in this section are common household items. You wont need them until Lesson 4, but you can keep an eye out and build your collection as you work through the next lessons. Can I Use Different [x]? Yes, but you may have difficulty with getting the same results as expected in the lesson. Paper is the most critical element in watercolor. Don't do watercolor on non-watercolor paper; it'll make the paper weep in despair and you'll know the paper is sad because it will bubble up and share its unhappiness with you. Cheap watercolor paper... it depends. Say you want to create a perfect flower painting, so you practice a bunch on Canson. The paint and water flow a certain way. Despite this, you get to a point where you can do the perfect petal and you are happy with it, and then you go to put that perfect petal on Arches... and whoops. The paint spreads differently and your perfect petal doesn't come out as intended. But then if we compare to making a fire with a bow drill or hand drill, you practice using cedar wood, because that wood is hard and very hard to make a fire with. If you can make a fire with cedar wood, you can pretty much use any of the common woods and get a fire. So you could practice on Canson for a while, to get the feel of the brush in your hand and the wetness of the brush and the thickness of the pigment on the brush, but then, before you swap to doing a "real" painting on Arches, you're going to have to practice a bit on Arches to get the feel for how the paper interacts with those qualities. You'll get a lovely flow on Arches that you wont get on Canson. Cold press paper is bumpy. Hot press paper is smooth. The bumps make some dry brushing techniques like creating sparkles on water easier, while smooth paper makes straight/smooth-line edges much easier. Rough paper is super-bumpy. Use your personal preference. If you don't know, get cold press. The less you spend on paper, the harder it will be to get expected watercolor effects, particularly paint-flow across the page into an already damp area, and sometimes the effects will even be impossible to do. My note on super-cheap watercolor paper for kids (like Walmart brand): It might be good for tearing off a corner and chewing on it as a replacement for bubblegum (if you don't mind that it's probably toxic), but it is not good for watercolor. You do not need the same colors or paints that are listed or shown here. Paints have different binders and composition which means they will mix and flow across the paper differently from brand to brand and even within colors within a brand. If you already own watercolors, use those until you decide if they are limiting your watercolor growth and learning. If your paints are professional tube paints (regardless of brand), it will be easier to prepare differing consistencies. No matter which paints you have (the ones listed here, or your own colors), you will still need to play with them to see how much water you need for different effects and how they flow across the paper. There's no shortcut to experience knowledge, no matter how Neo in the movie The Matrix got his. If you already have brushes, use them until you decide they are limiting your watercolor growth and learning. You need a sharp-point one (details), a round-point one (general mixing/painting), and a large one (wetting large areas and doing backgrounds).